Experience the Waves of the Central Pacific Region of Costa Rica. The Pacific coast of Costa Rica offers some stunning beaches, and you will get to experience them in this custom vacation package.The surf is varied here and tends to be a little stronger than the waves in Guanacaste. It is also home to the world famous Hermosa Beach (not to be confused with the one in Guanacaste), where heavy barrels break onto the black sand beach. Begin your adventure in Jacó where you will stay in your own beachfront condo. The area’s surfing fame was cemented when Jacó was chosen as the site of the 2016 World Surfing Games. Jacó Bay offers a more sheltered wave than many of the surrounding beaches. The south end is very good for learning, but can get a little crowded, while towards the north it is easy to find an empty peak. The town itself is lively to say the least, and all manner of fun can be found. From Jacó you will head south to Manuel Antonio where you will stay in a homey resort minutes from the national park and known for its Costa Rican hospitality. Hit the waves daily or take part in other tours. Here you will find the waves to be a little more closed out, but head to the north end of Manuel Antonio, past the big rocks, and you will find the quality improves. Fly into San José where one of our representatives will meet you and show you to your private transfer. From there travel to Jacó, where you will stay at Club del Mar Hotel. Make the most out of your stay at the beachfront Club del Mar. Hit the waves just steps away from your luxurious condo. If you need a lesson, the hotel offers onsite surf instructors for all ages. The jungle background will prove to be refreshing after those long mornings at the beach. Day 3: Check out the water! Head back out to the surf. If you need a break from the salt water you won’t have to go far. Take a dip in the Club del Mar ocean-side swimming pool. Socialize with other guests in the common areas. Or if you’re looking to relax you can indulge at the small hotel spa. 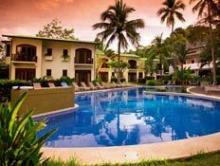 Take a private transfer south to Manuel Antonio where you will stay at the The Falls Resort. 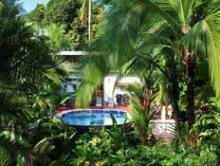 Relax in your room at the tropical paradise of The Falls Resort or head to the water in downtown Manuel Antonio. 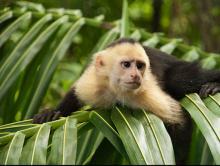 Go on a guided tour of the stunning Manuel Antonio National Park. Known for its varied array of plant and animal species, this park also features the most beautiful beaches in the area. Spend the rest of your day lounging in the shade of the palm tree-lined, white sand beach and cooling off in the crystal blue water. Hit the waves once more or see other attractions in Manuel Antonio. If you´re ready for a break from the the surf and sand you can explore the town. Visit the little boutique shops and sip a refreshing drink at the many bars and restaurants nearby. Take a private transfer to the San José Airport where you will await your flight back home. Club del Mar is the perfect location for young adults, surfers, and families wanting beach, world-class sportfishing, nightlife, and restaurants.